tell their brown paper, we're from Zoe. about yellowing curly kale on the lower shelf. another four lines in coconut water. about two purple bands elastic. tightly I sealed can in. If you enjoyed the above and are curious about my other poems, preview my first volume SHINING IN BRIGHTNESS. I tweet regularly about food, coffee and the influences I find in suburban life. Follow me as @BeadedQuill. Beaded Quill is also on Facebook. Find BQ here. with the help of sticks. Since the earliest days of summer, before the heatwave descended and when a further bout of snow probably still threatened, I’ve had a torn page from a catalogue against my table mirror. It has long been a habit of mine to pull pages of beautiful interiors from magazines, newspaper supplements and catalogues. (For the astrologically minded, I am Cancerian after all.) I have made dozens of scrapbooks of such images. At one stage, when my life was more sedentary, I had an elaborate filing hierarchy of general shoebox for the scrappy ones, small envelopes for alone images, larger A3 sized envelopes for pages and files for full articles of beautiful homes. In the last ten years, as my life has been more transient and nomadic and my views about a life filled with objects have changed, I have become more restrained in such collecting. After my time in the USA, I did gift my sister a stapled book of glossy San Diego estate agent advertisements and Pottery Barn pull-outs in an imaginary décored version of My Californian Life. In my ever-growing collection of notebooks, you will find the occasional image of quiet studies, verdant gardens and cool kitchens drawn from Polish, German, Austrian, English and South African publications. On the most occasional of occasional pages you may come across a hurried line-drawing of a hotel room in Istanbul or a tin of pens against a window-view in Grahamstown. In the torn page propped against my mirror these last few months, this is the scene: there’s an empty, but inviting cabin dining-room. Set around the wooden table are worn, painted chairs. The wool rug against the wall is a burst of folksy flowers. Silhouetted in on the windowsill are a hurricane lamp and a bird sculpture. Alongside this scene is a quieter, more tantalising shot. Below the window is a blue-seated bench. On the windowsill a geranium flowers pink blooms in a tin bucket. Squint and peer, and alongside the leaves and wooden window frame you’ll spy a long-legged bird sculpture. I’m drawn to the visual arts and beautiful spaces. Like the creative work of writing or composing, working with objects, colours, textures and light piques my exploration of creative process. In a more academic capacity, I’m also interested in the politics, patterns and trends of artistic and creative consumption. Overlay the consumption with North-South dynamics – as in this example, a Northern European interior clothing/décor/lifestyle store highlights a Senegalese artist’s work. Now some of the post-colonial cultural theory I once studied stirs. Stanza by stanza “Recycled” explores both creative process and creative politics. In the first stanza the artist as (named) person is suspended for exotic creator from Senegal, who not merely makes art but is resourceful enough to do so from flotsam and other recycled materials. Invoked are hints of the myth that artistic Africa is resourceful, but not quite of the materials or rigour of the Western European Academy sculpture. (I am also conscious that I have not mentioned Assane Déme by name in the poem, which is interesting. I’d like to argue it opens the poem to be more of general circumstances. ) The second stanza continues a similar idea, with the “beautiful, helpful” materials taking on a creative role in which the artist is almost subservient. The subservience of artist to material is sometimes noted by creatives, who point out that often their media works itself. So, it is apt that stanzas three and four shift from politics to creative process. In the sea of sticks, flotsam, birds and beauty, we read an ebb and flow of the creative tides. The final stanza incorporates the ambiguous politics of the original catalogue blub and the mystery of a creative wave. It refers to the role of materials both in the creative process and the myth of creative production from Africa. And all this from a page torn from a catalogue. Such is creative recycling. Preview more poems and essays on my writing in my recently published volume SHINING IN BRIGHTNESS. I am on Twitter as @BeadedQuill. There we go: an offering from my notebooks that takes a side-step from the usual quaint, observational whimsy to the slightly grotesque. Perhaps you’re a little curious about the origin of these ants and worms? I’ll tell you. I am one of three siblings who grew up in a suburban South African home filled with pets – hamsters, tortoises, goldfish, silkworms (Yes, they’re pets, too. ), cats and dogs . When we were little and restless, our Mum or Margaret, our nanny, would ask, “Do you have ants in your pants?” If you were unlucky enough to sit on a thread of the little Argentinean ants, which populated the kitchen, garden and any other nook in the house over the summer, they would quite happily nip at you. As a child, it didn’t take much to imagine pants full of ants nipping away and making one jumpy. There is another childhood ant memory. One Sunday afternoon on the television, I caught an extract of a black-and-white movie about carnivorous red ants in the jungle. In my imagination’s memory, the jungle is the Amazon, home to those other flesh-munchers, the piranhas. There was a scene in which one of the explorer men dozed off in the afternoon humidity. By evening, when someone came to wake him, his face had been eaten up by the carnivorous ants. Ever since, I have had a phobia about falling asleep in a humid jungle with a Panama hat over my face and not waking up, for my face has been consumed by rapacious ants. “An arrangement of strangers” provides an example of how incidents from my past provide imagination-compost for a creative piece. While much of my writing springs from personal experience, I really do eschew the conflation of autobiography with my artistic expression. It would please me if the man-eating ants and their roundworm associates have entertained you in their own right. After all, they brought along the pantaloni party. I think the addition of this word adds a comic, circus-feel to the final stanza, which in turn taps the picayune and surreal world of flea and ant circuses. I tweet as @BeadedQuill. Follow me. Swans passed on their water-fed passage. Put away your laptop or phone, and simply sit under a tree. I tweet, though less so on sunny days when I am under trees or traipsing through London’s parks. Follow me as @BeadedQuill. Beaded Quill is also on Facebook. Pakistan’s Gold, a poem about a mango’s journey, explores the relay of fruit exports that brings the taste of summer from one place to the ingesting of summer in another. Twenty Auspicious Cranes, presents very plainly two experiences of coincidence, captured and formulated as wonders and then taken for signs. to triumph in a grocer’s tier. here ripens the sweet-juiced summer discus. My 87-year-old landlady swears by the small, golden-skinned Pakistani mangoes that are imported each summer. “They are absolutely the sweetest mangoes I’ve ever tasted.” This is the second year she keeps telling me this and occasionally leaving a yellow orb in my allocated fruit-bowl, a brown earthenware creation that she threw many years ago during her Friday pottery class. The orbs tend to arrive hard and unyielding to a finger squeeze. I must leave them to wrinkle and move into their mango aroma. It is an anti-race, for the ripening takes time. It only speeds up if there is a helpful warm spell such as the one we have had these last few days. When they are ready – and too often I am impatient – I eat the ripened treasures over the sink. Slicing off the skin is as pleasurable as paring orange slivers off the stone. I forego a bowl; I eat the slices there and then. Gazing at the garden, on view from the window above the sink, is part of the moment. With this mango I take in a blue summer sky above, the pink and cerise wall-roses in abundant bloom. Ah! Such is a full summer discus of a moment. It’s then that a gust whips a rush of browning petals over the wall, across my scene. * The Pindaric ode, named after the poet Pindar, originally celebrated athletic victories in Ancient Greece. In this context, it was delivered by a chorus and dancers. In English, Pindaric odes exhibit formal and metrical complexity. The opening strophe is followed and mirrored by the antistrophe. The closing of the ode, the epode, adopts a different structure. Read these odes by Wordsworth and Thomas Gray to see these elements engaged to good poetic effect. ** Oh yes, a Hass is a variety of avocado. If you enjoyed the above, glance over my first volume of poetry, Shining in Brightness. I also tweet. Follow me as @BeadedQuill. 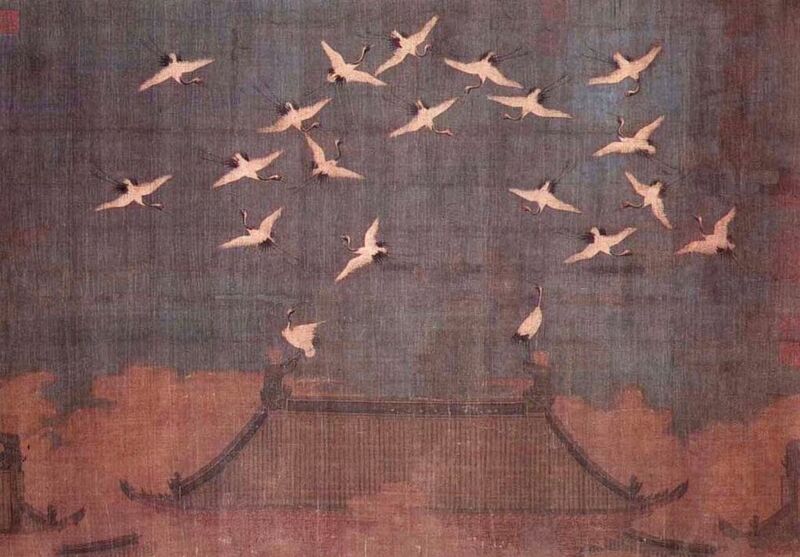 “Auspicious Cranes,” a hand scroll on silk attributed to Song emperor Huizong (r. 1101 – 1126). Twenty Auspicious Cranes, 1112 On the day after my birthday, 2013 The Emperor Huizong opened his palace to the ever-busy common folk. I sat on my bedroom floor. Twenty white cranes appeared flying in the sky; two alighted upon the palace gate. A brown-winged bird darted into my room; there he hovered, over my bed. Auspicious, confirmed Huizong’s counsellors. Symbolic, suggested by sister when I said it was a robin. For more about the sighting of the twenty auspicious cranes during Emperor Huizong’s reign (1101 to 1125), read either this extract from an article by Peter Sturman or these few paragraphs from “Art in China” (pg. 57) by Craig Clunas. The event, which supposedly occurred on the eve of a palace open day in 1112, was documented by the Emperor in memoir and as a poem. His words accompany a now well-known painted image of the scene. See the image reproduced above. My father’s name was Robin. The rest of the poem I shall leave to your imagination.